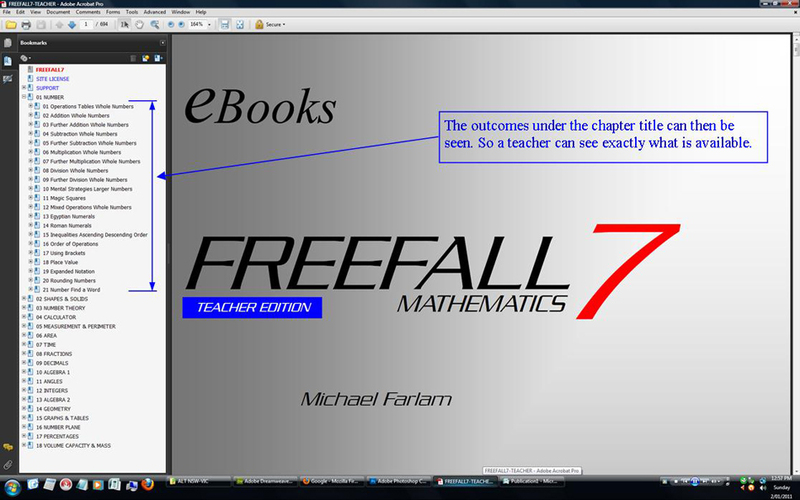 Freefall products are fully printable PDF files in Adobe Acrobat format, commonly referred to as an ebook. It is free to distribute with teachers (teachers edition) and students (student version) and offers a viable alternative to students traveling to and from school with a text book. When purchased it is supplied with 2 editions, the teacher edition with full worked solutions and the student edition with no answers. The teachers edition can be shared with all staff at the licensed school and the student edition can be shared with all students at the licensed school. 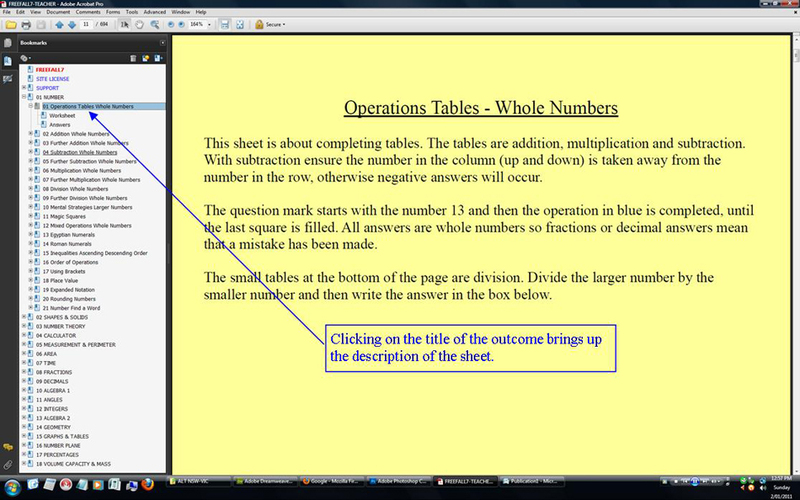 Each outome has its own 'outline' page to assist students with the worksheet and often offer worked examples.The ebook is simple to use and while large in size, it is easy to navigate through the book. This is how the book opens. The left hand side features a navigation pane for acessing the desired part of the book quickly. These chapters won't be a perfect fit for your syllabus, the scope of Freefall is to offer a broad and widespread coverage, so that while your syllabus will change over the years, Freefall sheets won't become irrelevant, they can be used forever ... and of course for free. The chapters have plus signs beside them, by clicking on the plus sign you open up the next branch. So the outcomes are all shown when you click on the chapter title. The number of outcomes vary, the image below shows the 21 outcomes uner the 01 Number chapter. Again by clicking on the plus sign, next to the outcome title, the next and final branch opens. This is the three pages offered under this outcome. The first page is an outline of the worksheet, the second page is the worksheet itself and the third is the answered page. 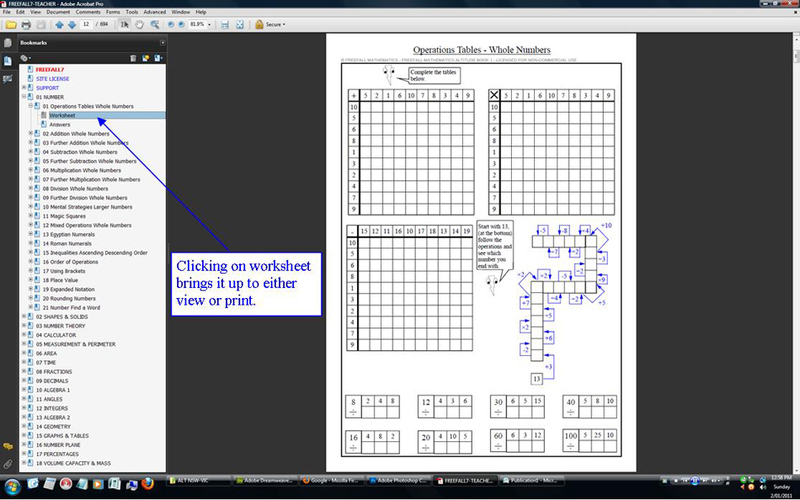 Click on the outcome title and you get the outline page shown now in the right hand side pane. 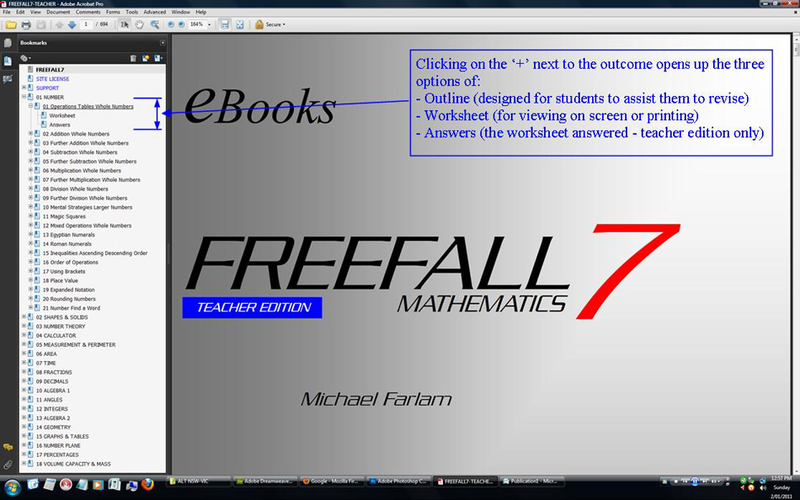 Click on the worksheet and the worksheet comes up. These worksheets are built for A4 pages with a 1 cm gap all around the sheet's border. 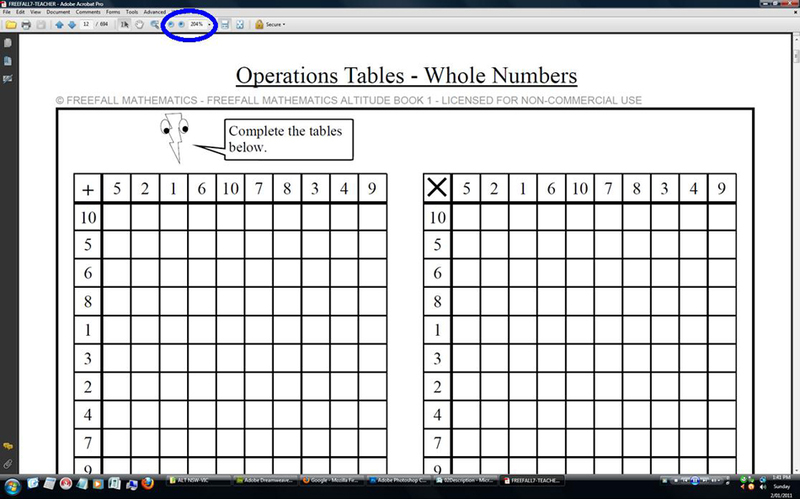 The view below has been zoomed back to show the full page, note that you can zoom in and out using the +/- key in the top bar. Printing the sheet is simple. 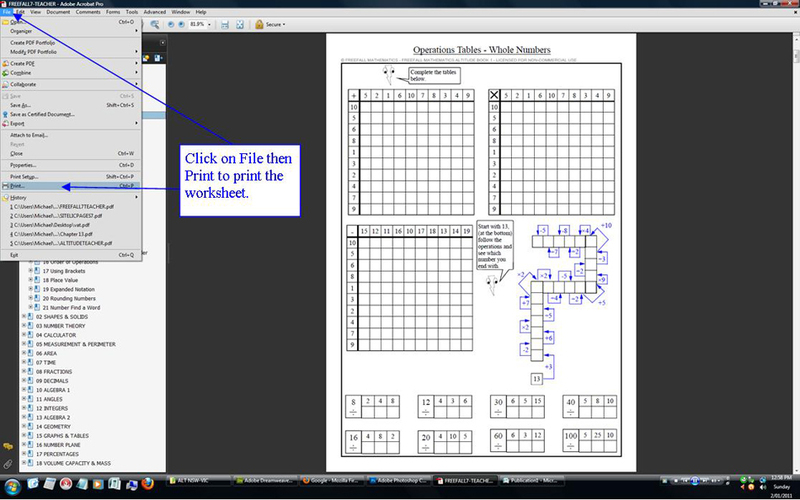 Just click on File then Print, select current page and you have a worksheet. Think what that will mean to every new teacher that walks into the staffroom with no resources. They are tech-savvy and will love the depth that this product offers. As a Head Teacher you will be well aware of keeping your new staff who feel the dual pressure of the lack of resources and class control. Freefall at least releases one of those burdens. But what about whiteboards. You can also use your current software on the boards as well. 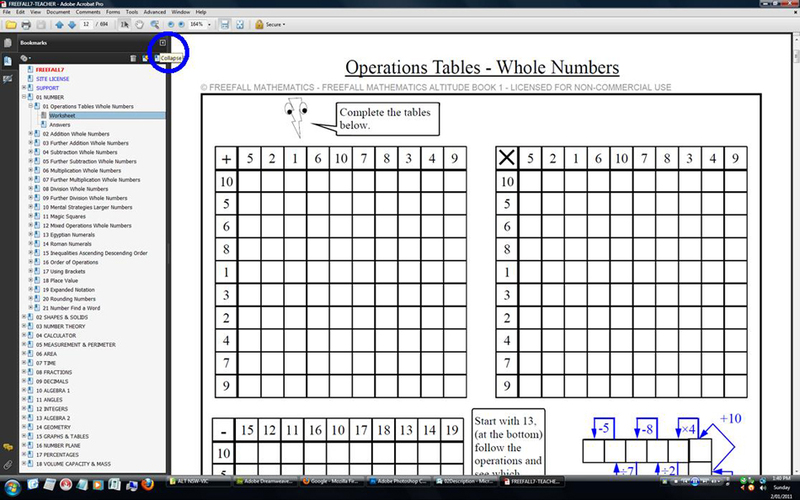 It is great that you can demonstrate the sheet on the board to help the students get started. Experienced teachers have worksheets, but they don't have digital media to project and print. 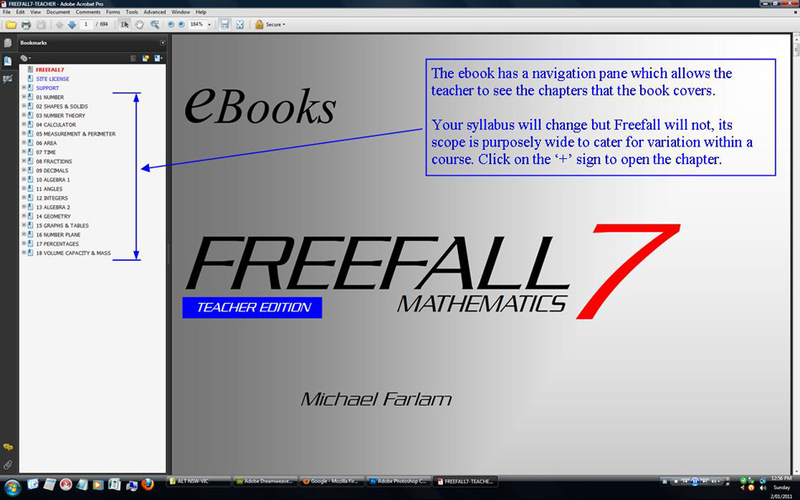 Navigate to the page as above, then remove the navigation pane by collapsing it using the button circled below. The worksheet then takes up the whole whiteboard. 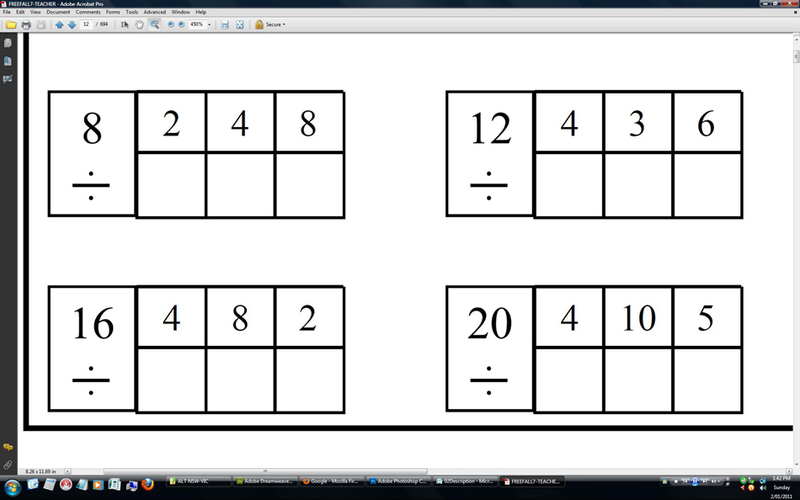 You can then slect the +/- tool to zoom in. You then use your interactive pens to answer the questions, or get the students to do so. With the whiteboard content matching the same worksheet the students have in front of them. Easy, even for the most tech-scared of your existing staff. So you have a product that can be printed for class use. Viewed on a whiteboard. Replaced if it is lost or destroyed. Requires no ongoing payment or reporting. Can be distributed with your students and staff forever without a user charge. Plus a low purchase price, if you need any more convincing email us any questions you have.